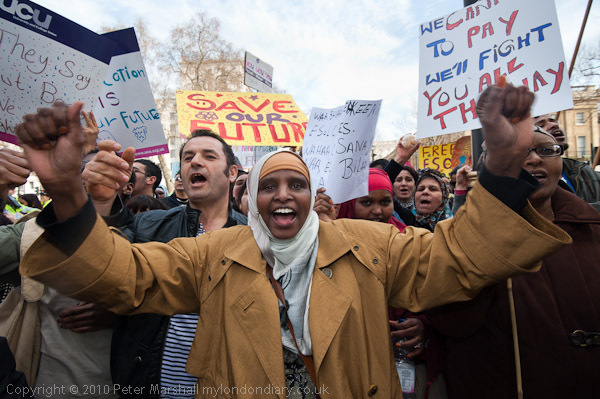 Just posted on My London Diary are my pictures from last Thursday’s ESOL (English for Speakers of Other Languages) Day of Action. It was a very fine day for the time of year, but started really slowly, and for some time I wondered if my journey into London had been worth it. 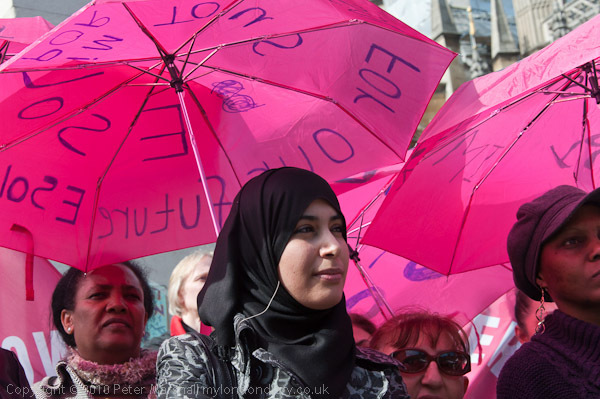 But things soon livened up, particularly with one very vocal group of students, mainly fairly young women, arrived and began to shout the slogans that had been provided as one of several educational resources on the web site for the day of action. 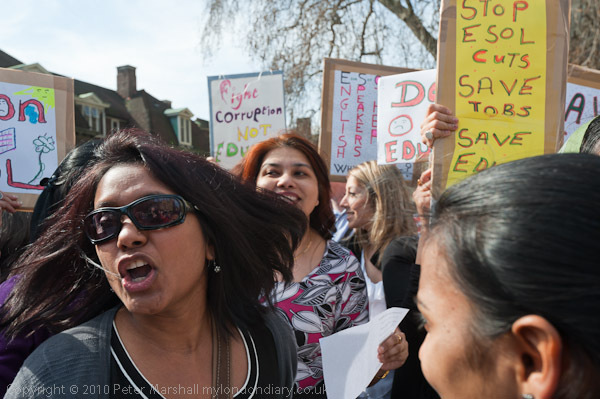 At least one of the other photographers had left before they arrived, and certainly missed the rally where many of the students spoke about how essential the ESOL classes were for them, where I very much enjoyed photographing both speakers and audience. The event seemed as if it was over by then, as although they were going to take a letter to Downing St, the police had advised that they go there in small groups rather than march as a body. So I’d actually left and gone to photograph another event taking place opposite Downing St when I saw the bulk of the ESOL students coming down the road and rushed across to take more pictures, including the one at the top of this piece. There was a very dense crush outside the gates to Downing St, making it rather difficult to move – hard to get far enough away to photograph these outstretched arms, even with the 16mm on the D700. It’s in really crowded situations like this that I like to use the 10.5mm fisheye with the D300 (perhaps one day I’ll get the 15mm which does a similar job on the D700.) I took a number of pictures, but I think the one at the top of this piece is the best. Fortunately I’ve managed to get Lightroom to stop automatically correcting the fisheye effect while still correcting for the vignetting and chromatic aberration (of which there is plenty.) The example here benefits from the way the fisheye curves in the placard at left and particularly the tree at right, although for some images a small amount of distortion correction or an appropriate filter does help. 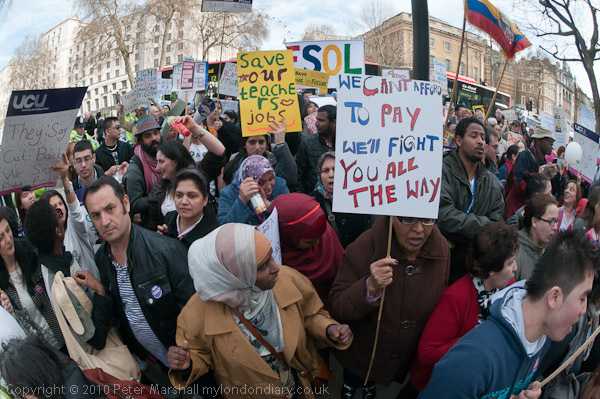 All of those that are in ESOL Day of Action on My London Diary are uncorrected. I hope the government can be persuaded to see sense over ESOL and realise the real value these courses provide, both to the individuals who take them and also to the country that benefits from the contribution that they enable these people to make. But unfortunately they seem bent on appeasing the racists and taking a very negative line on anything concerned with asylum seekers and refugees in particular and immigrants in general. This entry was posted on Monday, March 28th, 2011 at 08:11 pm and is filed under My Own Work, Political Issues. You can follow any responses to this entry through the RSS 2.0 feed. You can leave a response, or trackback from your own site. with video that clearly shows how the police lied to the demonstrators. It seems unlikely that the police will be able to press charges against the 138 who were arrested in the light of this evidence – and they may well be able to claim against the police for wrongful arrest.